Sell your own stuff and keep the money you collected. You just need to ‘rent’ a table for $15.00. If you are interested, contact Donna Johnson or Bruce Koskie for more info. Tax receipt will be issued for pledges of $15.00 or more. Meet at Deaf Centre Manitoba by 9:30 a.m. The walk starts at 10:00 a.m.
For further information, send us an email at campkakepitay@gmail.com or contact Jaclyn Demianyk or Bruce Koskie for further information. In the front area of Deaf Centre Manitoba. Proceeds to the Deaf camp for upkeep and renovation work. There is a big news that was published in Winnipeg Free Press on May 29th that Megan Jack graduated from University of Manitoba as a doctor! Manitoba has first Deaf doctor!! Congratulation to Megan Jack for accomplish her dream! Some of you have been asking me where to find ASL video on CRTC website which was mentioned at MBVRS Townhall on Thursday, May 23rd. The Canadian Association of the Deaf (CAD) will host its Board Meeting and Annual General Meeting in Winnipeg, Manitoba on July 11-13, 2013. The Annual General Meeting is open to the public and it will be held at the Forks Inn (75 Fork Market Road) on Friday, July 12th at 1 p.m. and Saturday, July 13th at 8 a.m. The CAD invites members, friends, supporters, youth, seniors, delegates, and anyone to attend Townhall Meeting to discuss... about VRS Issues & CRTC’s Process, Restructuring CAD, and Social Enterprise Information. The agenda will be distributed shortly and the Townhall is free and open to the public. ASL & LSQ interpreters will be provided at the Townhall Meeting. L'Association des Sourds du Canada (ASC) tiendra sa réunion du conseil d'administration et l’assemblée générale annuelle à Winnipeg, au Manitoba, sur la date du 11 au 13 juillet 2013. L'assemblée générale annuelle est ouverte au public et se tiendra à The Forks Inn (75 Fork Road Market), le vendredi 12 juillet à 13 heures et le samedi 13 juillet à 8h. L’ASC invite les membres, les amis, les gens qui supportent, les jeunes, les personnes âgées, les délégués et toute personne à assister à le réunion municipal pour discuter de la SRV, les questions et le processus du CRTC, la restructuration de ll’ASC, et de l'information de l'entreprise sociale. L'ordre du jour sera distribué sous peu et l'Hôtel de Ville est gratuite et ouverte au public. Les interprètes en ASL et en LSQ seront fournis lors de le réunion municipal. Connect Society—Deafness, Education, Advocacy & Family Services (“Connect Society”) is a not-for-profit agency providing services and supports to Deaf and Hard-of-Hearing children, youth and adults and their families. Connect Society employs 42 staff members, and has a complex and diverse funding base of $2.2 million. Connect Society currently seeks a Chief Executive Officer. Reporting to the Board of Directors, the successful candidate will provide leadership and management to implement established policies and strategic direction.  Diversity and its impact on decision-making. Preference will be given to applicants with competency in American Sign Language and understanding of Deaf Culture. Red River College is a leader in applied learning and innovation. Our talented team of employees is passionate about education, innovation and student success. We offer competitive salaries, extensive benefits, and the opportunity for personal and professional growth in a rewarding career. Together, we are going places. Duties: Developing and updating course outlines and curriculum as required; instructing in classroom, lab, and tutorial environments; counseling students and evaluating student progress; supervising/organizing students’ independent projects and practicum; coordinating workshops with guest speakers and outside agencies; participating in departmental activities outside the classroom; assisting with College activities including student registration and orientation; responding to inquiries from potential applicants and interviewing applicants. · A degree from a recognized post-secondary institution, an equivalent combination of experience and/or training may be considered. Candidates are asked to specifically address the above Qualification Requirements in their application. Candidates chosen for interviews will be required to provide a portfolio of their recent professional and creative work. Instructors employed with Red River College, are required as a condition of employment, to complete a Certificate of Adult Education (CAE). This position may be required to work evenings. We seek diversity in our workplace. Aboriginal persons, women, visible minorities and individuals with disabilities are encouraged to apply. Educational Supplement of $2,725 or $5,450 per annum respectively pro-rated on an hourly basis. 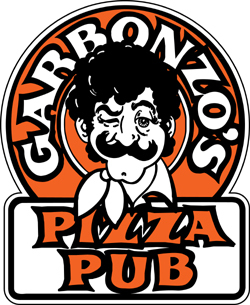 As posted earlier AVLIC 2014 will be having a fundraiser on June 7 at Garbonzo's Pizza Pub in the old bus depot. 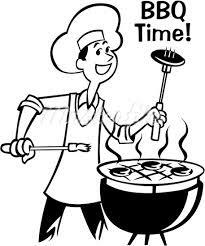 The event runs from 5:30 - 9:00 p.m. and tickets are $15 which includes 1 - 8" pizza and a drink (pop, Kool-Aid or beer). Many of you have been asking what exactly this is. It is like a Bud, Spud and Steak night but with Pizza and a drink instead. There will be a meat raffle, a basket raffle and a pottery sale. A giant Jenga Tournament will take place with prizes. You will have time to meet old friends and make some new ones. Meat raffle: We will arms length tickets and winners will take home meat. Jenga Tournament: Form a team of two and let Suzanne or Tessa know who is on the team. $5 per team to enter. Prizes for top three teams. You MUST have a ticket before coming--we are not allowed to sell them at the door. Contact us if you want to buy one and we can arrange to hold them at the door for you. Thanks for supporting the interpreting community! Nominations must be received no later than 14 days prior to the Annual Meeting (May 13th, 2013). The agenda and minutes will be available through the DRC after May 17th 2013. Please RSVP to bonnie.heath@eccoe.ca or sign up at the Forks so that we can have an accurate number of participants. Refreshments will be provided. Exciting...Website/Scheduling software. It will demo by Community Services Relations Chair- Rick Zimmer. Fun for all ages! Meet with 35 Cartoon Characters, Disney Princesses, and clowns – enjoy performances on the stage and field – with Fresh IE, Sean Quigley, Buzz & Boomer and the Blue Bomber Gymnastic Squad. Don’t forget your cameras! Over 80 churches worshipping together, declaring One Lord, One Church, One Harvest in our city & province. Please carpool with 4 or more people per vehicle to park at the stadium. Handicap parking will be available right beside the door. but all the concessions will be open. You can fill your empty water bottles at the fountains. CHVN office at 1-741 St. Mary’s Rd. as well as at the gate. Fill in your ticket for prize draw for Bomber Tickets! This is a cost recovery event. 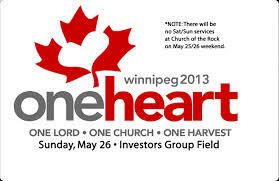 A freewill offering will be received to help cover event expenses and to donate to Winnipeg’s inner city ministries working with underprivileged families. on sale during the months of May and June. and his new wife Alyssa Buchholz. BBQ Burger Supper There will be NO Burger Supper this year. 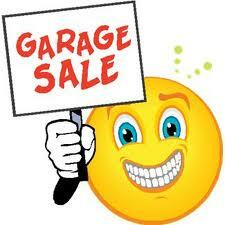 Community Garage Sale Saturday, June 1st, from 9:30 a.m. until 2:30 p.m.
donation. Contact Donna Johnson for information. enjoy the walk. Contact Jaclyn Demianyk for information. 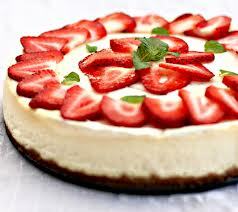 well as August 23-30, 2013 for the Eastlock Lodge only.